Despite all of my domestic and world travel—and even all of my Disney vacations prior to 2018—I had never taken a cruise, let alone a Disney Cruise Line voyage. I had not even seriously considered booking a cruise. 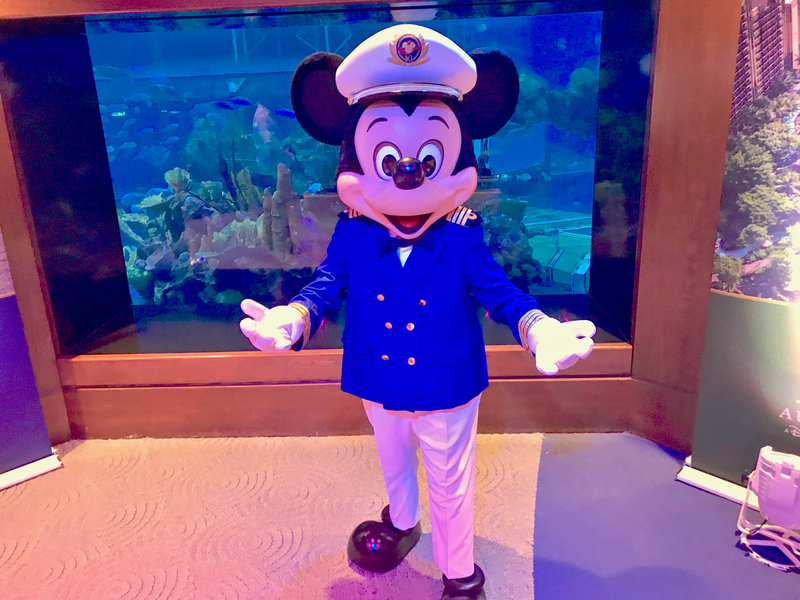 Captain Mickey paid a visit to Epcot in January for a presentation to members of the media about Disney Vacations, including Disney Cruise Line, Adventures by Disney, and Aulani, a Disney Resort and Spa in Ko Olina, Hawaii. Photo by Alan S. Dalinka. This July, DCL will mark the twentieth anniversary of the launch of its first ship, Disney Magic. And, yes, I was quite impressed with Disney Magic when I was invited to a Port Canaveral media day in 2016 to tour the ship, view its broadway-style production of Tangled: The Musical, and dine in the Animator's Palate dining room. Likewise, I was impressed with its sister ship, Disney Wonder (launched in 1999), when I was invited to a Port Canaveral 2017 media day for a tour, to view its broadway-style production of Frozen, and to dine in its Tiana's Place dining room (you can read what I wrote about that visit here). 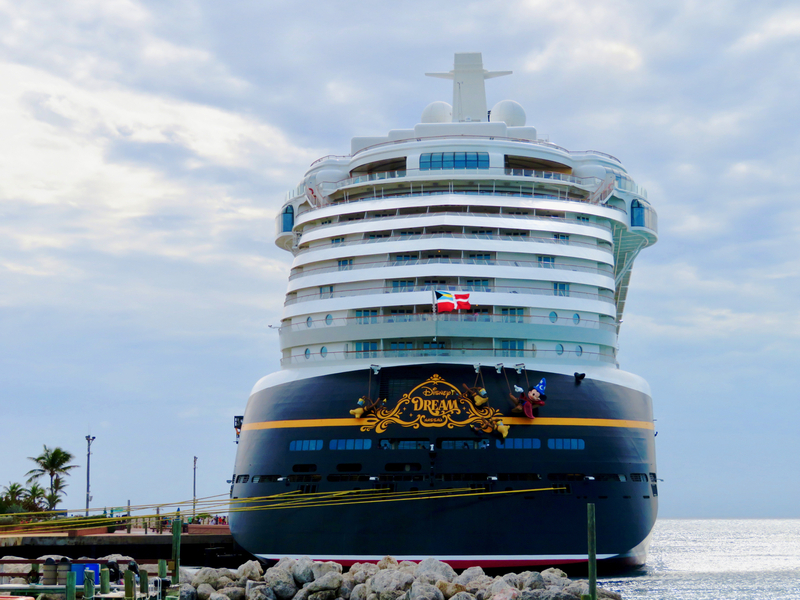 Both "Disney Dream" (shown here) and "Disney Fantasy" have 1,100 outside staterooms (88%) and 150 inside staterooms. 70% of the staterooms on the smaller ships, "Disney Magic" and "Disney Wonder," are also outside staterooms. Photo by Alan S. Dalinka. Even given those experiences, I still was hesitant to take a cruise, even a Disney cruise. I tend to travel alone, as readers of our MousePlanet Walt Disney World Resort Updates may already know. Mix in that my preferred travel experiences do not really include beach time, water recreation/sports or pools, or even the solitude of sitting somewhere quietly reading, and also that popular (and now known to me to be totally false) myth that a Disney Cruise is really just for families with little kids, and you may understand where I was coming from. Maybe you share some of these thoughts too when considering your vacation options. Then, Disney invited me and a guest on a three night Bahamas cruise aboard Disney Dream (the DCL ship first launched in 2011) from January 19-22, 2018, along with other members of the media. If you follow MousePlanet on Facebook and/or Twitter, you may have seen my #InvitedByDisney posts during my #DisneyCruise. Simply stated, I had a great time! You can see a recap of the relevant tweets (and quite a few photos) at this Twitter Moment (it was also embedded in the MousePlanet Walt Disney World Resort Update for January 23-29, 2018). This replay of Facebook posts during the media-invited cruise includes the statue of Admiral Donald in the atrium of "Disney Dream," shots of the ship, Funnelvision, and some of the Jedi Training activities kids in Disney's Oceaneer Club can enjoy while sailing. Photos by Alan S. Dalinka. 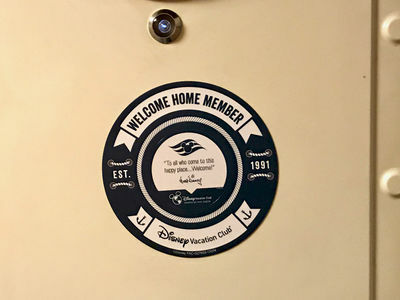 I also learned a great deal about DCL that I did not already know, including most importantly, that a Disney Cruise really does provide opportunities for families and friends of all ages to have fun together, as well as separately, by age group. I will cover a lot more of the details below and you can get a recap of them in my chat on the Garry Meier Show podcast Episode 292 (jump to 33:40 for the DCL discussion; the earlier portions of the podcast may not be suitable listening for all ages or locations). 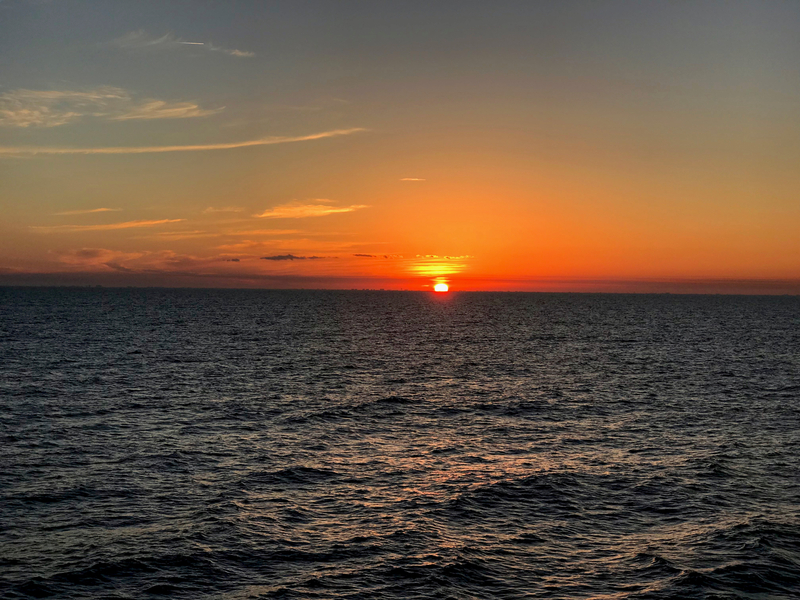 A personal travel highlight for me sailing aboard "Disney Dream" was watching the sunset into the Atlantic Ocean along the Florida Coast. I had seen Atlantic sunrises from Florida before, and Gulf of Mexico sunsets too. 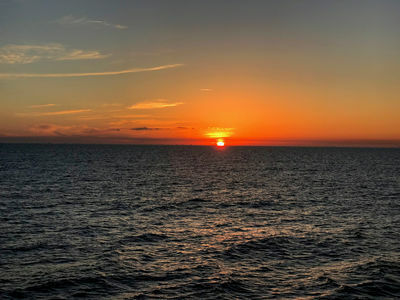 I had already seen many sunsets into the Pacific Ocean, but never a sunset viewed from the Atlantic Ocean looking back toward North America. Photo by Alan S. Dalinka. 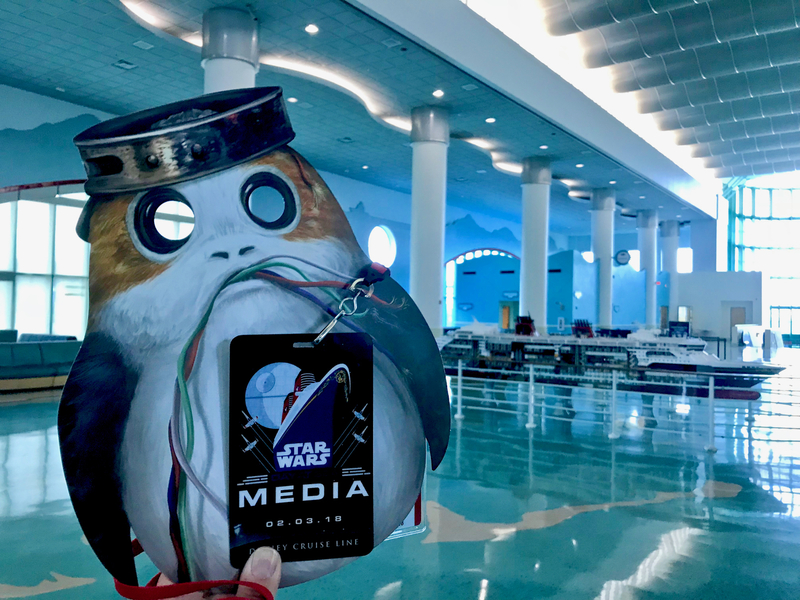 Just over a week after my cruise aboard Disney Dream, I was invited to return to Port Canaveral for a media preview day of a "Star Wars Day at Sea" aboard Disney Fantasy (the newest of the DCL ships; launched in 2012). As you might imagine from the name of the day, and, as I am old enough to remember seeing every one of the Star Wars movies in the theater during their initial releases going back to 1977, that too was quite a fun opportunity. 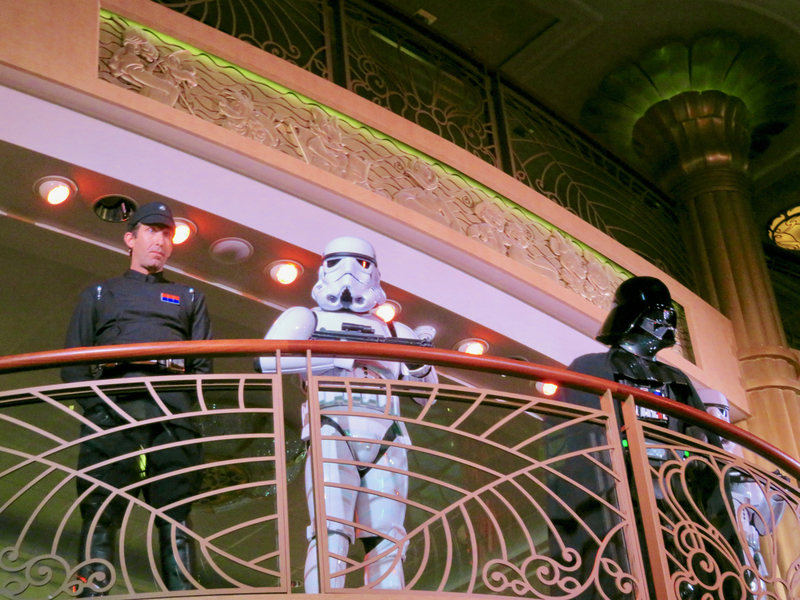 I witnessed the Imperial takeover of the ship in its atrium lobby, saw Jedi training, met some of the characters of the Star Wars universe, and sampled some of the Star Wars-themed cuisine served during a "Star Wars Day at Sea." I will discuss this more below too. 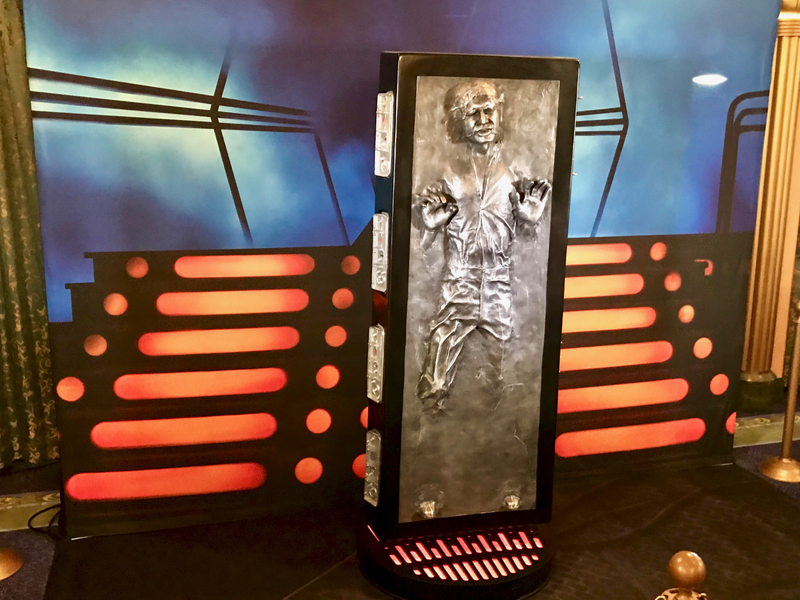 An invited-media preview was held on February 3, 2018, at Port Canaveral presenting highlights of a "Star Wars Day at Sea" on select sailings of DCL's "Disney Fantasy." Photo by Alan S. Dalinka. 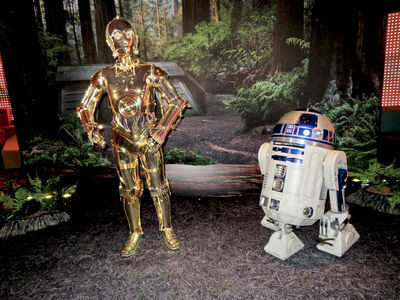 Even before boarding "Disney Fantasy" from the terminal for the media preview, Imperial Forces began searching for Rebel infiltrators. Photo by Alan S. Dalinka. Lest you be wary that my writing about DCL is colored by being invited by Disney, here is why I do not think it is. If you were not already aware, over more than the past couple of decades, I have spent tens of thousands of dollars on Disney vacations. 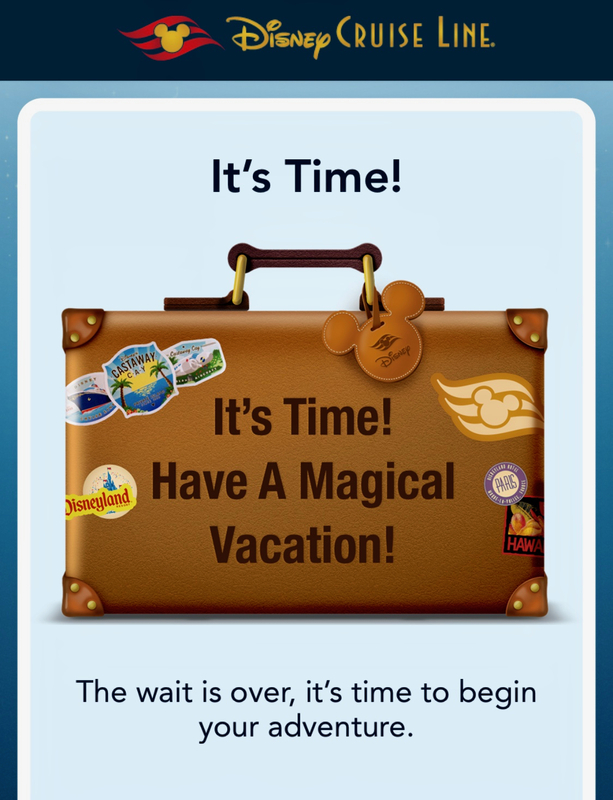 I have been a Disney Vacation Club Member since making my first purchase of points in 2000 (I currently own contracts for three "home" resorts), and I spend thousands of dollars each year to maintain that membership. In addition to visits I made to Walt Disney World as a kid in the 1970s and 1980s, and those that I paid for as an adult in the 1990s and in 2000, I have been a Walt Disney World Annual Passholder for most of the time from late 2002 to the present (my next expiration date is in January 2019). I have also purchased many tickets to visit the parks of Disneyland Resort, and, a couple of times, I also purchased tickets to visit the parks of Disneyland Paris Resort. My bias, if I have one, is that I am a Disney fan; indeed, I am now writing for, and you are reading, a Disney fan site. And yes, in the name of fullest disclosure, I am also a Disney shareholder (though with over 1.5 billion shares outstanding, my little stake is several decimal places away from even a fraction of a percentage). 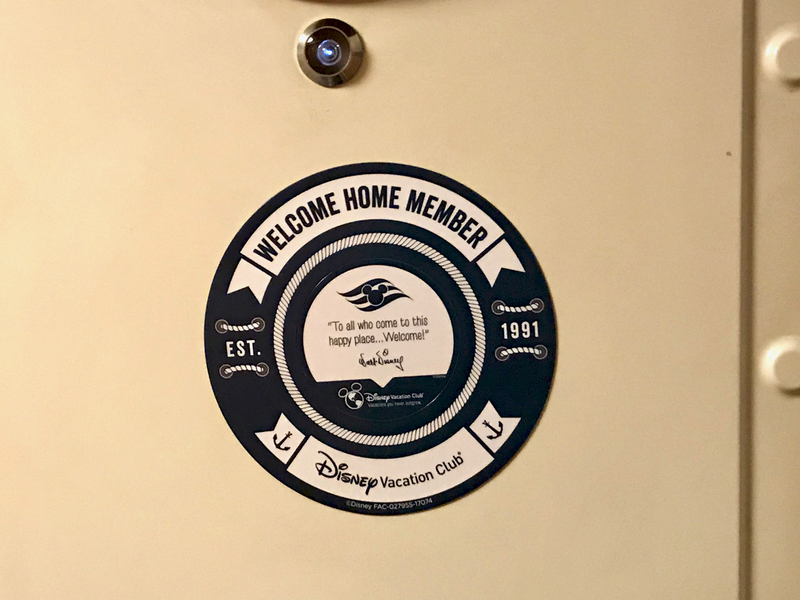 Disney Vacation Club Members receive a special "Welcome Home" on their Stateroom's door aboard Disney Cruise Line ships and there are other Member activities and opportunities aboard. Photo by Alan S. Dalinka. As you probably have discerned just from my introduction above, Disney Cruise Line's home terminal is located at Port Canaveral, Florida (which is within eyesight of Cape Canaveral and the Kennedy Space Center). It is about an hour's drive east of the Walt Disney World Resort on the Atlantic Coast, and a somewhat longer drive from Orlando International Airport. As you would hope, the terminal is designed with Disney theming throughout: from the grand departure hall all the way to the Mickey-shaped funnel leading to the dock's connection to the DCL ship's Atrium Lobby where each traveling party is welcomed by a personal announcement and the cheers of some of the crew. 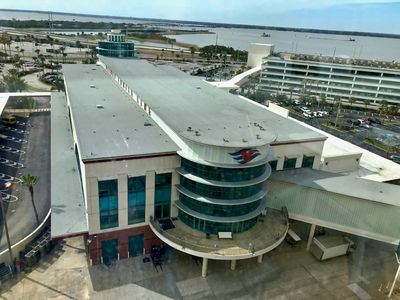 The Disney Cruise Line Terminal at Port Canaveral was specially designed with Disney theming throughout. Photo by Alan S. Dalinka. 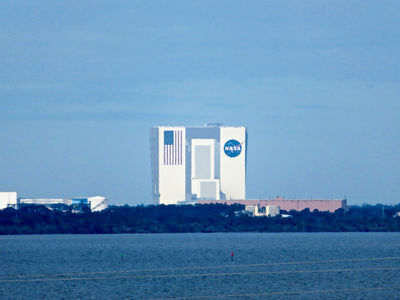 Ships docked at Disney Cruise Line's Terminal at Port Canaveral are within sight of the Vehicle Assembly Building at Cape Canaveral's Kennedy Space Center. Photo by Alan S. Dalinka. While Port Canaveral is DCL's home port, it is, by no means, its only port of departure. DCL has sailings from Miami, San Diego, New York, and other ports around the world, with itineraries beyond the Bahamas and Caribbean, including Alaska and Europe. All of DCL's ships sail under the flag of the Bahamas. 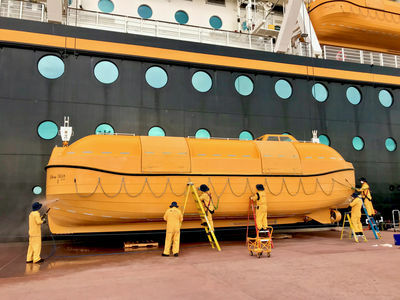 DCL's first two ships, Magic and Wonder, were built in Italy and are each 984 feet in length (about three U.S. football fields, not including end-zones), 106 feet in beam (the widest point at the waterline), with 11 passenger decks for up to 2,700 passengers, plus 950 crew. DCL's newer ships, Dream and Fantasy, were built in Germany and are each 1,115 feet in length (longer than three U.S. football fields, including end-zones), 121 feet in beam, with 14 passenger decks for 4,000 passengers plus 1,400 crew. Three more DCL ships, slightly larger but of the same capacity as Dream and Fantasy, are scheduled to be built for service in 2021, 2022, and 2023. The four current DCL ships look like the classic ocean liners of the early 20th Century. Although it took special permission from the U.S. Coast Guard to make its lifeboats yellow rather than the traditional orange, the main colors of the ships—red, white, black, and yellow—should be familiar to any fan of Mickey Mouse. I got to see just how stately and well-kept Disney Dream appeared docked at Nassau, Bahamas, (or, in Disney terms, "neat and pretty") next to another cruise line's dirty whitish vessel with lots of visible rust stains, dirty portholes, and very a cheap-looking (probably plastic or fiberglass) hodgepodge of yellow and orange-colored slides on its pool deck. At each port of call, it was easy to spot Disney crew members washing (swabbing? ), scrubbing, sanding, painting, and otherwise cleaning the ship. At a port of call, a crew lowers lifeboats one-by-one and thoroughly cleans them. Photo by Alan S. Dalinka. DCL touts a number of included features of its cruises that differentiate it from others in the industry. 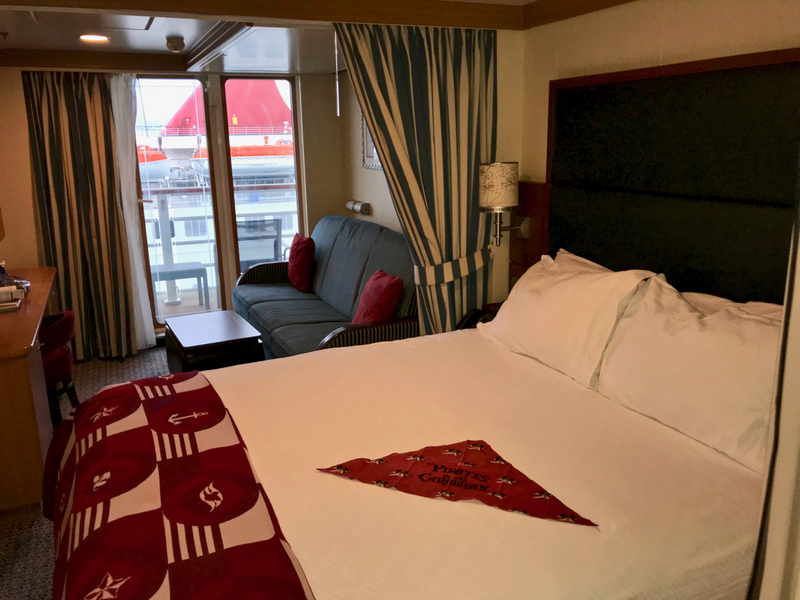 Those of you that have been on other cruise lines can probably elaborate with more detail on how the cruise lines vary on the following subjects, but as a first time sailor, I found all of these features certainly added up to a great vacation. First and foremost, Disney is an entertainment company, so that is where the discussion begins; Disney prides itself on excellent storytelling, offering quality entertainment and service, and DCL delivers it. Every DCL sailing includes an impressive amount of included on-board entertainment options. The most noteworthy of which are the Broadway-style shows offered on each ship. 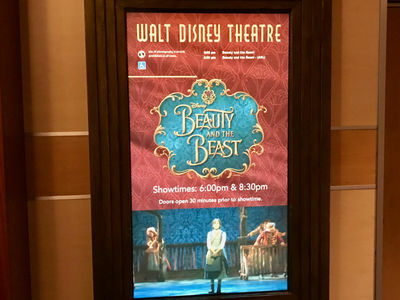 As you may recall from Donald & Bonnie Fink's article back in November, Disney Dream currently features an all-new production of Disney's Beauty & The Beast during its sailings. This exclusive production, announced back in July at Disney D23 Expo in Anaheim, uses the latest in cutting edge technology to create scenery in the 1,340 seat, 3-deck tall Walt Disney Theatre. Actors bring the enchanted objects to life by puppetry; selected songs from the animated feature, Broadway stage, and live-action feature are used to tell the "tale as old as time." The newest production of Disney's "Beauty and The Beast" is presented exclusively aboard "Disney Dream" as some of the included ship-board entertainment. Photo by Alan S. Dalinka. The Broadway-style shows are joined by other Disney-themed variety or character-featured shows on other nights of each DCL sailing. 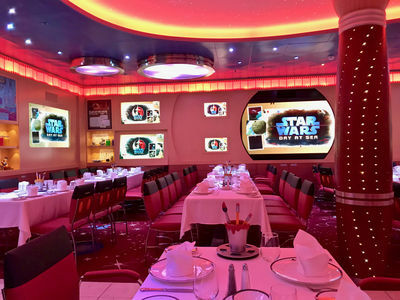 Each ship also has a state-of-the art movie theater featuring first-run Disney films, available at the same time at sea as they were released across the United States (so, for example, Star Wars: The Last Jedi premiered back in December aboard DCL ships at the same time as in U.S. theaters). Televisions in staterooms also offer an impressive collection of Disney, Pixar, and Marvel films on-demand. 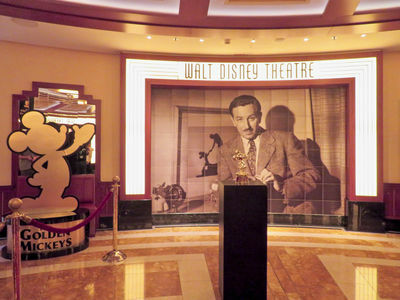 "The Golden Mickeys" stage show, featuring many Disney characters and songs, is also presented aboard "Disney Dream" in the Walt Disney Theatre as some of the ship-board entertainment. Photo by Alan S. Dalinka. 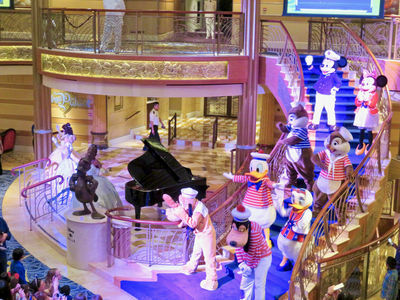 Disney characters, under the leadership of Captain Mickey, vacation aboard DCL ships. Even the princesses have been known to make meet and greet appearances. 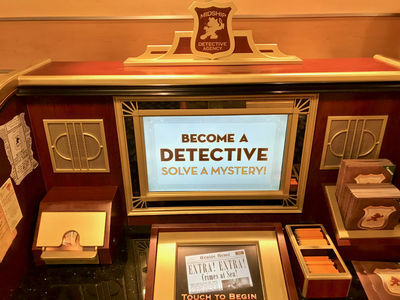 There are also scavenger hunts (for all ages) that have you follow clues about some characters all over the ship. 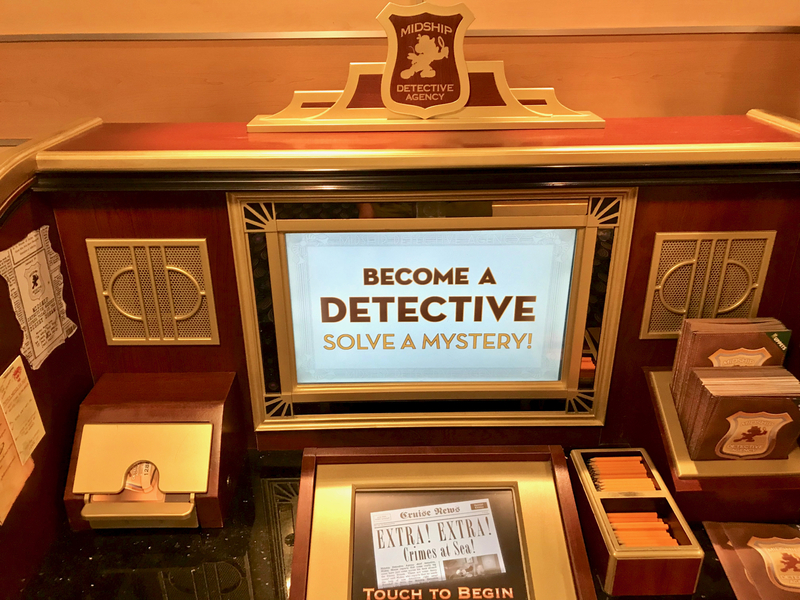 The Mid-ship Detective Agency provides a scavenger hunt for all ages; passengers follow and look for clues and interact with Enchanted Art pieces around the ship that "magically" come to life. Photo by Alan S. Dalinka. DCL ships also host on-deck parties. 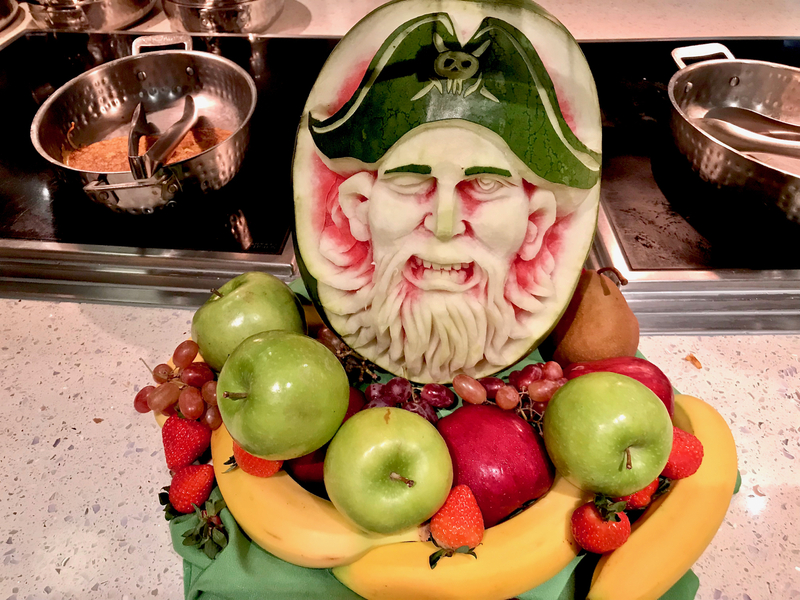 Sailings in the Caribbean and Bahamas, like the one I traveled aboard Disney Dream, include a "Pirates in the Caribbean" party, featuring Captain Jack Sparrow and, of course, fireworks! Disney touts that DCL was the first cruise line to offer a fireworks show at sea (and may, currently, be the only one). 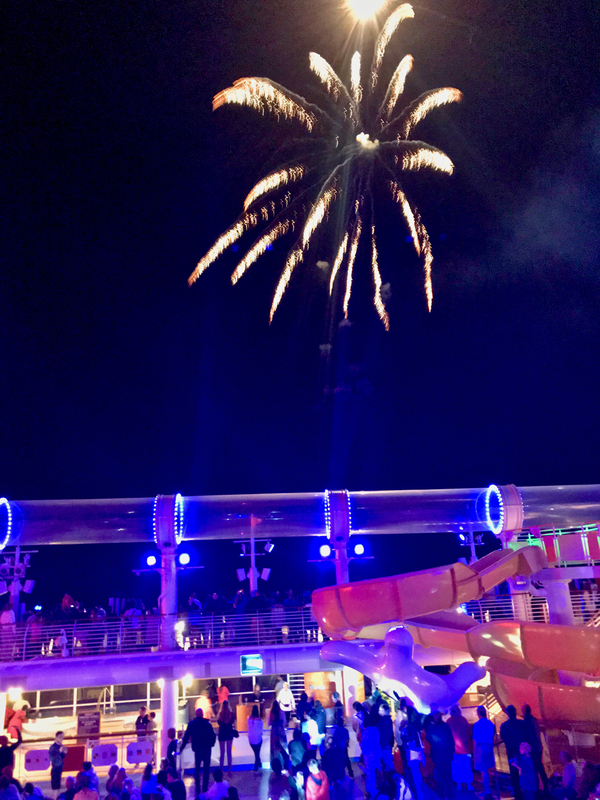 During my sailing, another line's ship seemed to be visible within sight of Disney Dream during the fireworks so its passengers could sneak a peak at the spectacular. The "Sailing Away" deck party showcases lots of the Disney characters aboard for the cruise just beneath the large video screen called "Funnelvision." Photo by Alan S. Dalinka. 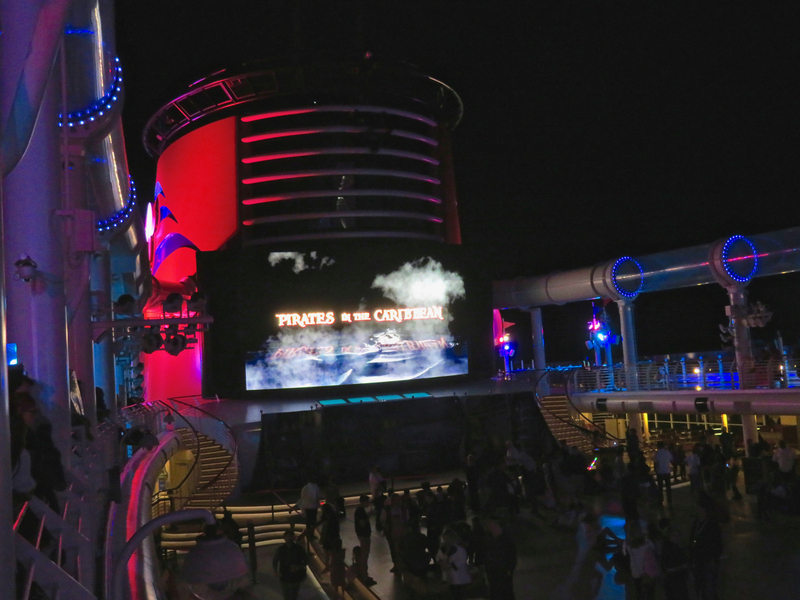 Naturally, a Disney Cruise in the Caribbean includes a night of pirates. Photo by Alan S. Dalinka. 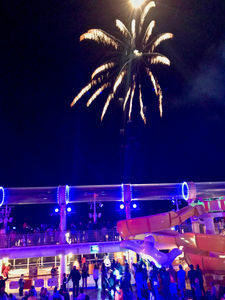 The Pirates deck party includes Disney Cruise Line's "fireworks at sea" spectacular. Photo by Alan S. Dalinka. 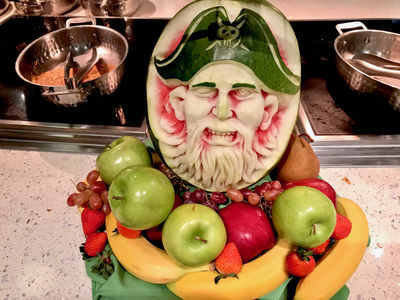 After the Pirates deck party, it is time to head to the late night buffet to see all the intricately carved foods (and maybe grab a late night snack). Photo by Alan S. Dalinka. The ships also have several smaller performance venues featuring live entertainment throughout each sailing. 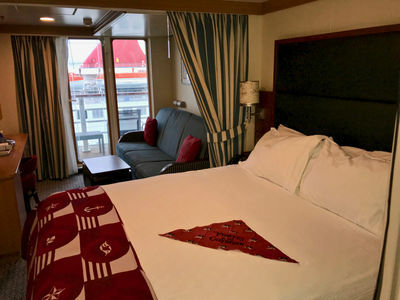 Trivia contests, interactive "game shows," karaoke, lectures, and on-board tours are all among the scheduled activities you can find during a DCL sailing. Then, of course, there are the several pools aboard each ship. Dream and Fantasy boast what Disney says is the first at-sea water coaster, the AquaDuck. (Magic features the AquaDunk, while Wonder has the Twist 'n' Spout water slide.) The main pool on Disney Dream's Deck 11 even faces what DCL calls "Funnelvision," a giant video screen on one of the ship's funnels. During one afternoon of my cruise, lots of football fans splashed in the pool and gathered on deck to watch an NFL playoff game live. Funnelvision is available on all four DCL ships. 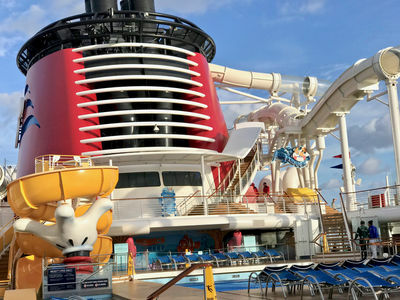 The AquaDuck aboard "Disney Dream" was the first-of-its kind "water coaster" on a cruise ship. Photo by Alan S. Dalinka. In addition to all of the entertainment for passengers of all ages to enjoy together, DCL ships feature many age-restricted areas: the tot-exclusive "it's a small world" nursery, the older kids' exclusive Disney's Oceaneer Club and Oceaneer Lab, the Edge tweens-only club, and the Vibe teens-only club. 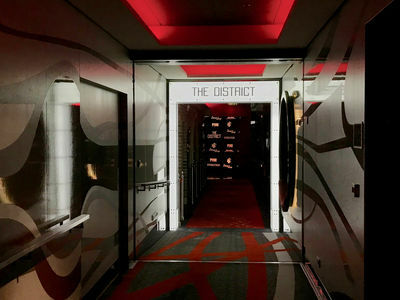 Adults can enjoy quite a few of their own spaces too; an adults-only nighttime entertainment area (on Disney Dream, named "The District"), adults-only pools, sun decks, and bars. Like at Walt Disney World (and other Disney destinations), kids can get styled at a Bibbidi Bobbidi Boutique aboard DCL ships, and adults can enjoy the services of the Senses Spa & Salon (all for an extra charge, of course). 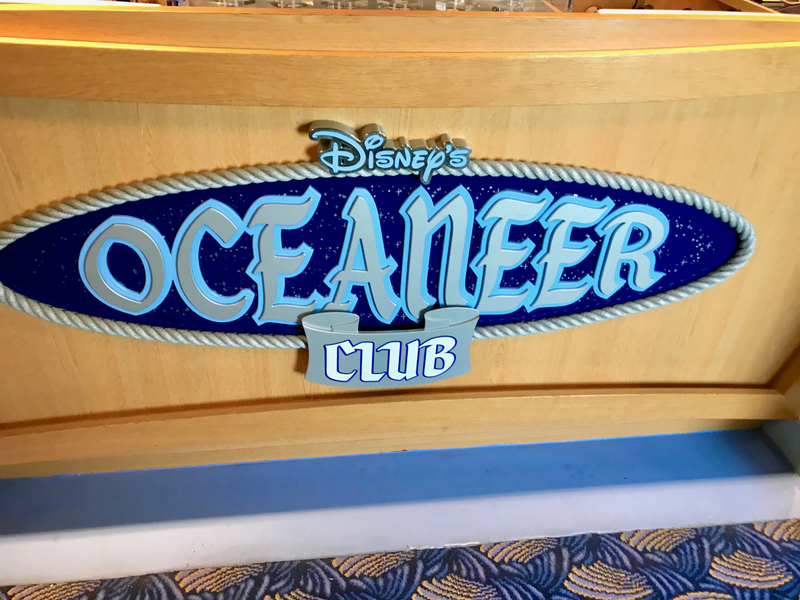 The age-restricted kids areas like Disney's Oceaneer Club and Oceaneer Lab seem to be quite popular with kids too, as aboard Disney Dream, I heard kids outside the entrance tell parents that they planned to stay all day and then did not want to leave. (Yes, the kids need to be checked in and out by a parent or guardian.) Except during "Open House" hours, adults are not allowed inside the Club or Lab. 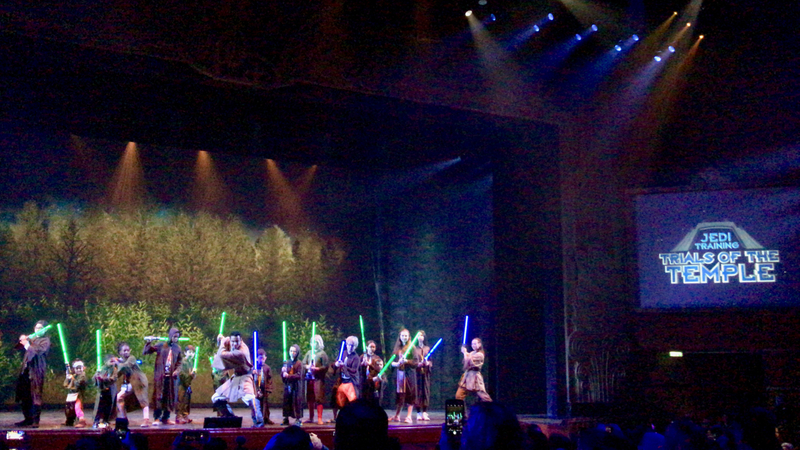 During a morning pre-opening preview for media aboard Disney Dream, I even got to see a sample of some of the Jedi training in use of The Force available to kids during their time in the Club—done right in the cockpit of the Millennium Falcon itself (Disney Fantasy has its own Rebel base)! 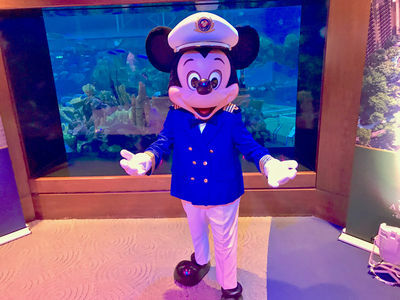 The kids-exclusive Disney's Oceaneer Club and the connected Oceaneer Lab aboard DCL ships gives kids numerous hands-on, Disney themed activities (including Toy Story, Marvel, and more). Photo by Alan S. Dalinka. Aboard "Disney Dream," just one of the kids areas is the cockpit of the "Millennium Falcon" where kids can get taught how to use the Force or even use flight simulators to fly some of the ships of the Star Wars universe. Panoramic photo by Alan S. Dalinka. As an adult sailing without kids, I was very impressed that, while I knew there were a lot of kids aboard Disney Dream, I did not see many of them except when passing the kids-exclusive areas, or in the family activities like the deck parties and Walt Disney Theatre shows. Disney even provided the invited media guests like me an opportunity to sample one of the adults-only (additional charge) activities aboard the ship—a mixology class providing a hands-on opportunity to learn to make (and then sample) several mixed cocktails. Each of the DCL ships have areas reserved for adults only. Aboard "Disney Dream" The District is the adults-only nighttime entertainment area, including lounges, bars, nightclubs, and more. Photo by Alan S. Dalinka. 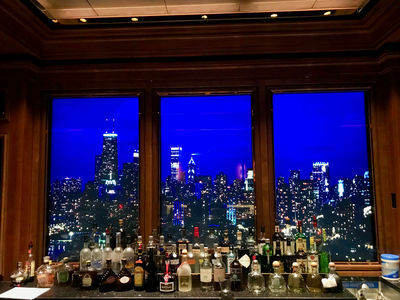 The Skyline Lounge in The District (aboard "Disney Dream") rotates views out its "windows" of several different skylines around the world, including a place very familiar to me. Photo by Alan S. Dalinka. Each of the DCL ships includes three main themed dining rooms which passengers rotate among during their sailing for their dinner service. One of the special DCL touches here is that your servers also rotate with you during your sailing; the same cast members serve your meals no matter the main dining room in which you are assigned to dine. The soft drinks and food are all included in the cruise fare. Adult and other specialty beverages are also available for an extra charge. As for the theming itself, of course, this is where the Disney touches become even more special. 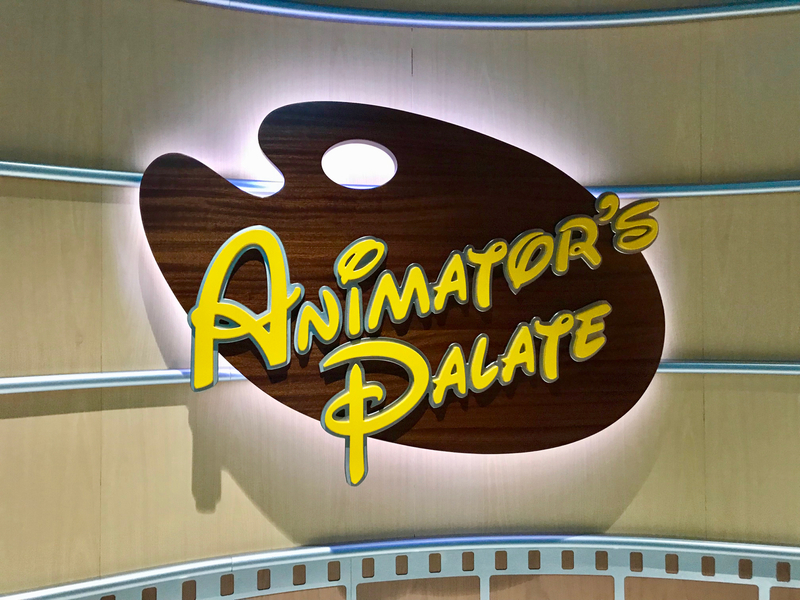 On each of the DCL ships, one of the dining rooms is Animator's Palate. This dining room includes special lighting and video screens that change during the duration of your meal. I have had the opportunity to experience the fun colorful transformation of the room and a special animated show when I visited Disney Magic a few years ago. During my Disney Dream sailing, Crush and some of his friends from the Disney-Pixar film Finding Nemo paid us a visit and talked with diners throughout the room (just like at Epcot's "Turtle Talk with Crush" attraction). Animator's Palate is one of the main dining rooms on each of the four DCL ships. In all of the main dining rooms, all of the food and soft drinks are included in the cruise fare. Photo by Alan S. Dalinka. Folks have told me that the cruise industry standard for many years was that soft drinks at meals were not included in cruise fares. DCL's rotational dining, on the other hand, includes soft drinks at no additional charge as mentioned above. DCL, though, even takes that one step further by including fountain beverages at its buffets, and at 24-hour fountain stations on the same deck as its quick-service food options. Adult and other specialty beverages are available at an additional charge in numerous places around the ship too, of course. All four DCL ships also offer adult-exclusive (but additional charge) dining options. Remy, themed to the Disney-Pixar movie Ratatouille, is a French restaurant available on both Disney Dream and Disney Fantasy. 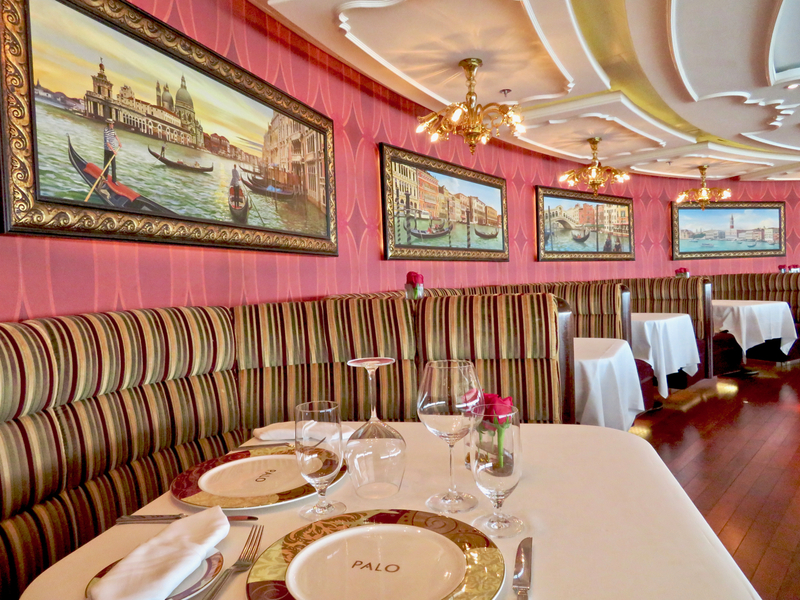 Palo, an Italian restaurant, is available on all four DCL ships. Disney invited me to dine at Palo aboard my Disney Dream sailing, and it may have been the best meal I have ever had at a Disney dining location; the food and quality of service were beyond reproach. At the recommendation of many before dining there, I even splurged (calorie-wise) and had the amazing chocolate soufflé. Beyond the main dining room, Remy is an adult-exclusive (and extra charge) French restaurant aboard both "Disney Dream" and "Disney Fantasy." Photo by Alan S. Dalinka. 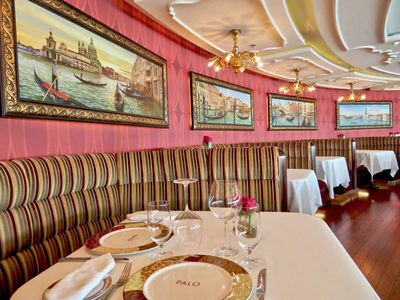 Palo is an adult-exclusive (extra charge) restaurant found on all four DCL ships. Photo by Alan S. Dalinka. If all those food options are not enough, DCL sailings also include 24-hour complimentary room service. Beyond that, while ice creams and desserts are offered in several places aboard the ships as part of the overall cruise fare, Disney Dream now also has Vanellope's Sweets and Treats, a shop themed around Vanellope von Schweetz from Disney's Wreck-it Ralph, offering premium (additional charge) candies and ice cream treats. There are also special (additional charge) snack stands outside the ship's theaters. 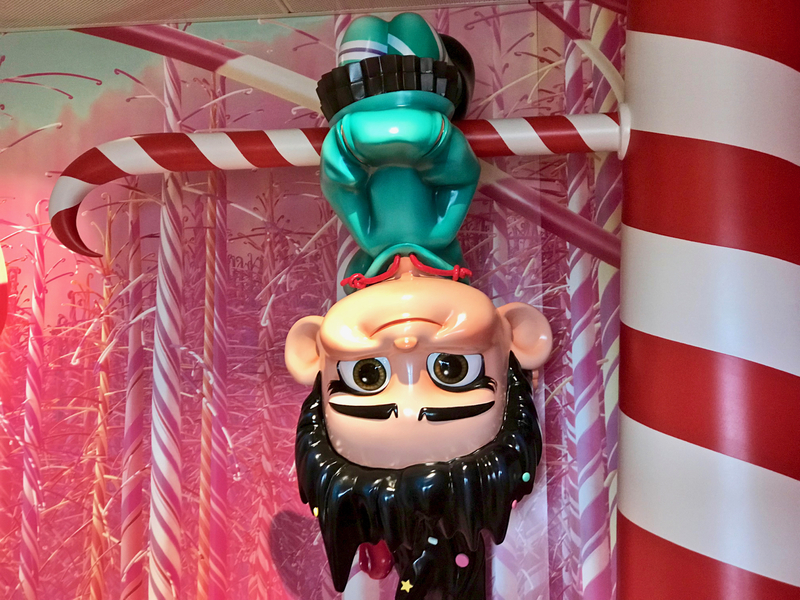 Vanellope von Schweetz from Disney's "Wreck-it Ralph" has her own shop filled with specialty "Sweets and Treats" available for purchase above and beyond all of the ice cream and treats included on the cruise and available elsewhere on board "Disney Dream." Photo by Alan S. Dalinka. 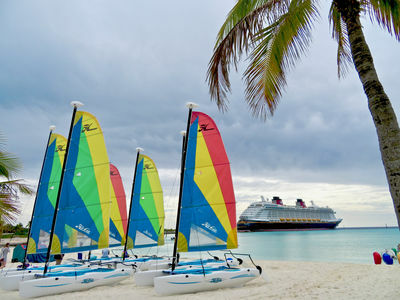 When Disney decided to create DCL, it entered into a 99-year lease agreement with the government of the Bahamas for a private island for its ships to visit. Castaway Cay (pronounced "key") is a 1,000-acre island exclusively for the use of DCL guests. DCL's Bahamian and Caribbean itineraries usually visit the island; on some cruise itineraries, ships visit the island twice. 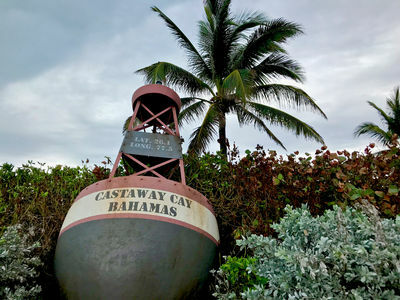 Castaway Cay, Bahamas, is Disney's private island visited only by DCL ships (on most itineraries sailing from Florida ports). Photo by Alan S. Dalinka. One of the great features of Castaway Cay is that DCL ships dock at the island itself, which means passengers can get on and off the ship directly on to the island without need to take a launch or tender to land. The water at the island is that color of blue you would expect to have seen in an artists' rendering rather than in an actual place. One great feature of Disney's Castaway Cay is that DCL ships are able to dock at the island, thus eliminating the need to transfer passengers by tender or launch. When you wish to get on or off the ship, you simply walk. Photo by Alan S. Dalinka. For those that do not want to walk from the boat dock to the family beach, dining facilities, or the adults-only beach (Serenity Cove), just beyond the dock, complimentary trams are available. Photo by Alan S. Dalinka. There is no doubt that the island is, in fact, Disney's. Photo by Alan S. Dalinka. 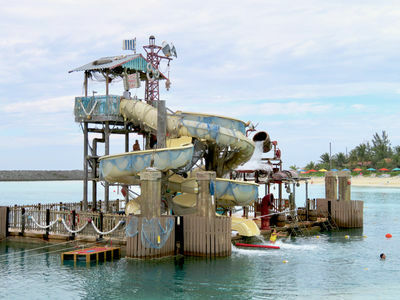 Castaway Cay has water play areas, water sports activities, dining facilities featuring barbecue, and, like DCL ships, age-restricted areas for kids, teens, and adults-only (including both an adults-only beach and a few places to enjoy adult beverages). Guests can rent premium cabanas, get open-air massages, take yoga classes, and find other Port Adventures available (all for additional charges). 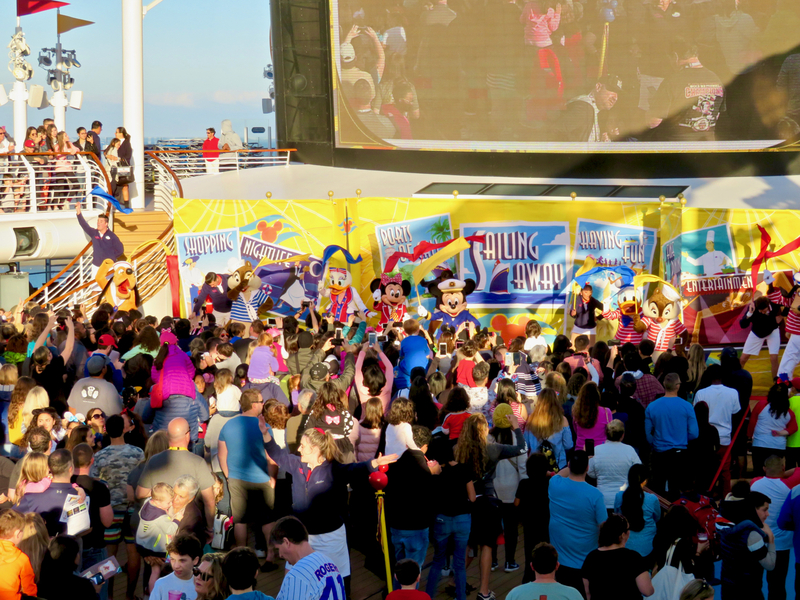 Disney characters visit the island too, and even host a few parties during a DCL ship's visit. Even on a partly-overcast day, the color of the water surrounding Disney's Castaway Cay seems nearly unreal. You can swim or play in it or even play on it: the family beach has numerous watercraft available for rental. Photo by Alan S. Dalinka. 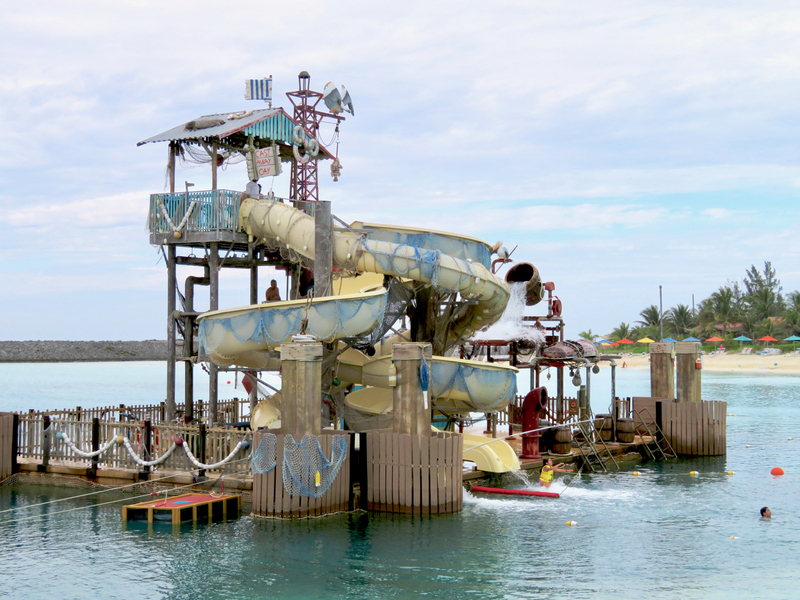 Castaway Cay's main water slide requires a little bit of swimming before you can climb to the top for your plunge. Photo by Alan S. Dalinka. The color of the water surrounding Disney's Cataway Cay seems like it was painted by a Disney artist rather than nature. Photo by Alan S. Dalinka. 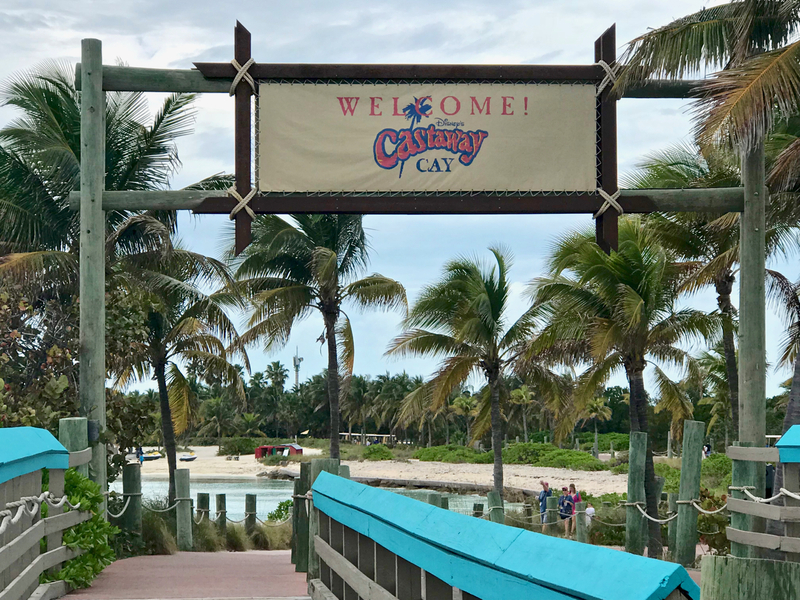 For the second consecutive year, Castaway Cay won the distinction as "The Top Cruise Line Private Island" in the 2017 Cruise Critic's Cruisers' Choice Destination Awards. As I wrote at the beginning of this article, though, I am not much of a beach/water vacationer. I did enjoy exploring Castaway Cay for a few hours and having lunch there. I also appreciated that there was a full slate of activities to do back aboard Disney Dream while others enjoyed the beaches and other recreation on the island, and that it was so easy to get back on board the ship when I was done exploring Castaway Cay. 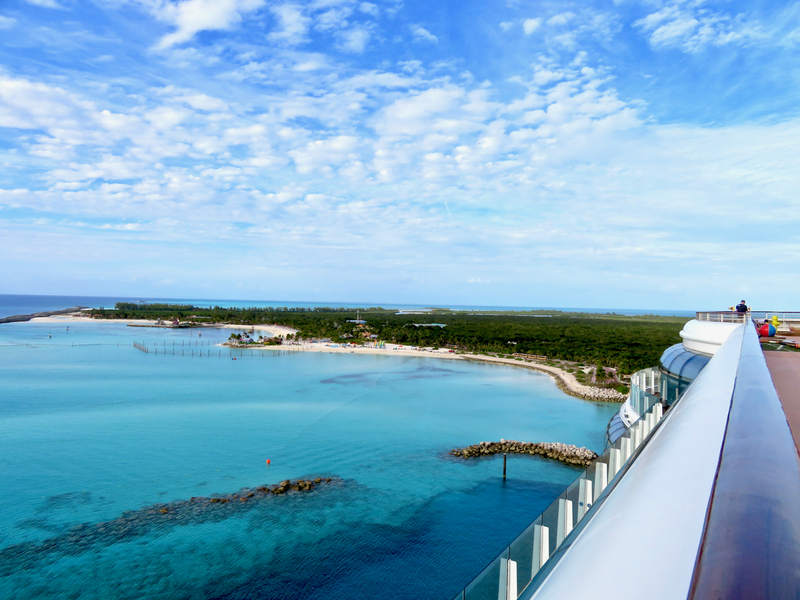 Visit Serenity Cove at Castaway Cay. Video by Alan S. Dalinka. 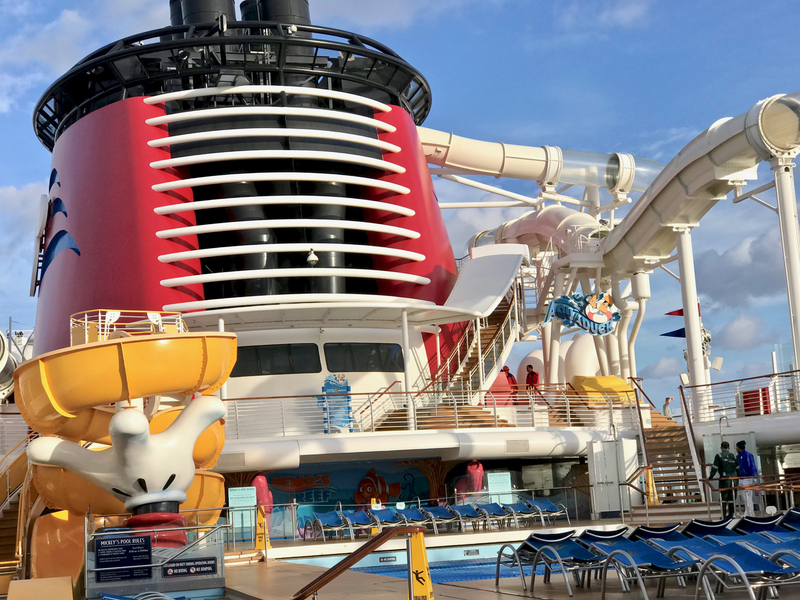 A critical piece of advice shared with me before sailing and that I now share with you: be sure to download the Disney Cruise Line Navigator App from the Apple App Store or Google Play Store ahead of your sailing. 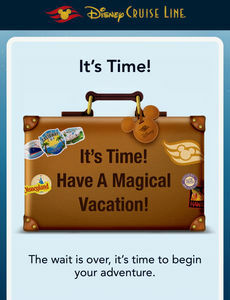 Before your sailing begins, all the App shows you is a countdown until your departure. But, once you set sail, and even if you put your iOS or Android device in Airplane mode to prevent you from incurring international roaming fees, the App comes alive when you connect to the ship's WiFi (even without purchasing an internet package) with all sorts of useful information about your sailing, including that day's entertainment offerings, character meet and greets, and tips. The Navigator App counts down the days until your cruise, and then comes alive when you connect to the ship's WiFi. Screenshot by Alan S. Dalinka. The App even includes a messaging feature that allows you to send text-like messages back and forth to your fellow passengers (again, even if you have not purchased an internet package and without incurring international roaming charges). When visiting Castaway Cay, much (but not all) of the island also is within range of the ship's WiFi (and boosters). Alternatively, each stateroom includes two portable phones which can be used for communicating between passengers when aboard ship and on much of Castaway Cay (though, with the App, I never even removed them from the charger in the stateroom to give them a try). 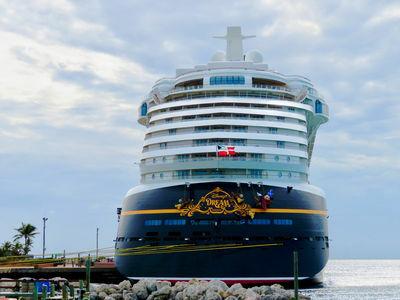 Disney Dream was the third ship launched by Disney Cruise Line. Built in Germany and registered in the Bahamas, it made its maiden voyage on January 26, 2011. It is 216 feet in height, with 14 passenger decks, including 1,250 Staterooms for up to 4,000 passengers, and a crew of over 1,400. Its usual sailing itineraries are three-, four-, and five-night cruises in the Bahamas, departing from Port Canaveral, Florida. You can find more information about Disney Dream and all DCL sailings at DisneyCruiseLine.com, or by calling (800) 951-3532 or your travel agent. On the final night of the sailing, the characters (including princesses) aboard gather in the Atrium for a farewell party. Photo by Alan S. Dalinka. 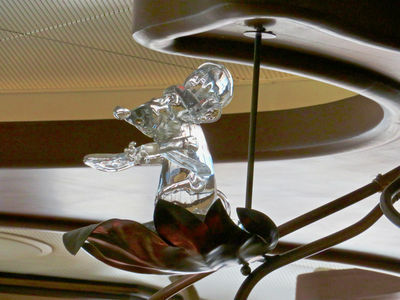 Want to know even more about Disney Dream? Just yesterday, Contributing writer Jim Korkis shared Some Secrets of the Disney Dream. 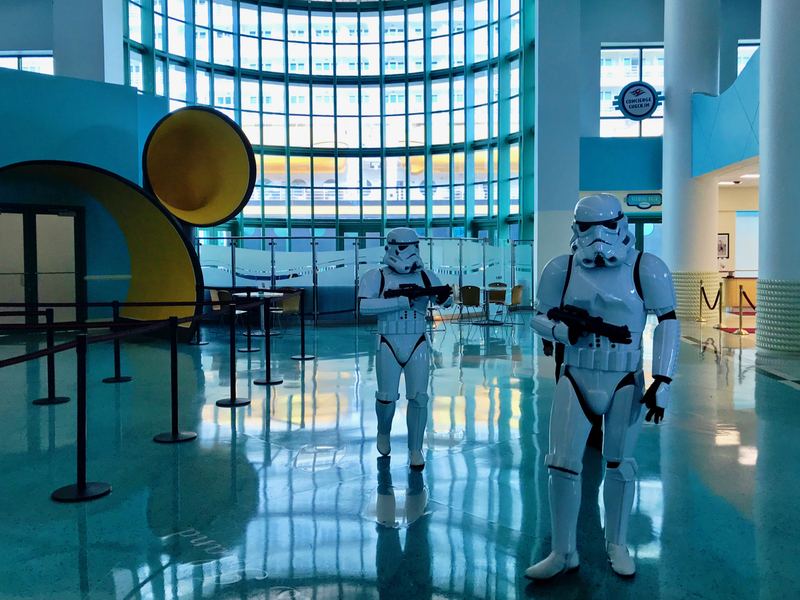 As I mentioned in the introduction, shortly after my sailing on Disney Dream, I had the opportunity to return to Port Canaveral to visit Disney Fantasy for a media preview of a "Star Wars Day at Sea." On special seven-night sailings of Disney Fantasy departing from Port Canaveral, a full day of the voyage is devoted to celebrating Star Wars stories. Like I got to see during the media preview, the day begins with Imperial forces under the leadership of Darth Vader taking over command of the ship in its Atrium Lobby. 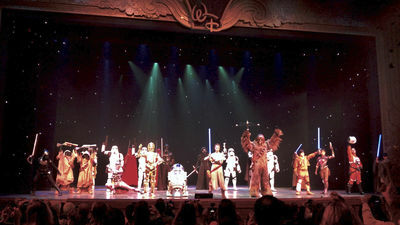 The Star Wars films and television shows are shown in the Buena Vista Theatre (movie theater) all day long. Star Wars photo opportunities and character meet and greets are available throughout the day; passengers can go on a Porg hunt inspired by Star Wars: The Last Jedi. Younglings can receive Jedi lightsaber training in front of a hidden Jedi temple (similar to the experience at Disney's Hollywood Studios and at Disneyland Park), and everyone can enjoy a deck party that is capped with a Star Wars-themed fireworks display at sea. 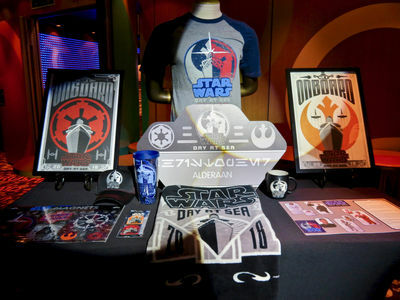 And, of course, special Star Wars-themed foods, beverages and merchandise are all available to passengers. 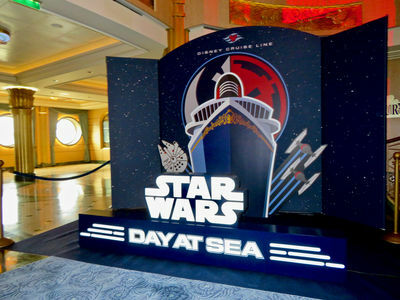 Photo backdrops are available during a Star Wars Day At Sea. Photo by Alan S. Dalinka. 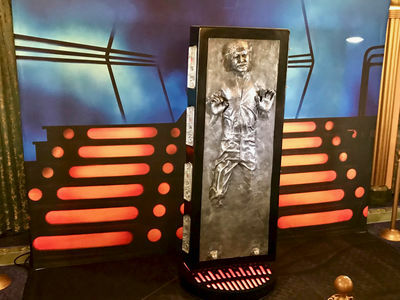 You can pose with Han Solo (at least while he is frozen in carbonite) during a Star Wars Day at Sea. Photo by Alan S. Dalinka. 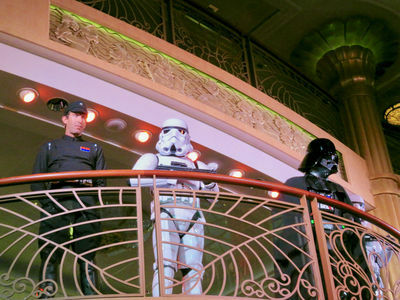 Imperial forces under the personal command of Darth Vader take over the ship and look for rebel spies in the Atrium. Photo by Alan S. Dalinka. On the Walt Disney Theatre stage, the characters of both the light side and dark side of The Force gather. Photo by Alan S. Dalinka. 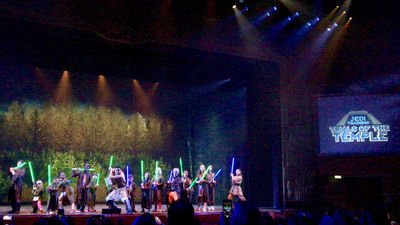 "Younglings" can learn to wield a lightsabler in Jedi Training: Trials of the Temple (which is very similar to that done at Disney's Hollywood Studios at Walt Disney World). Photo by Alan S. Dalinka. 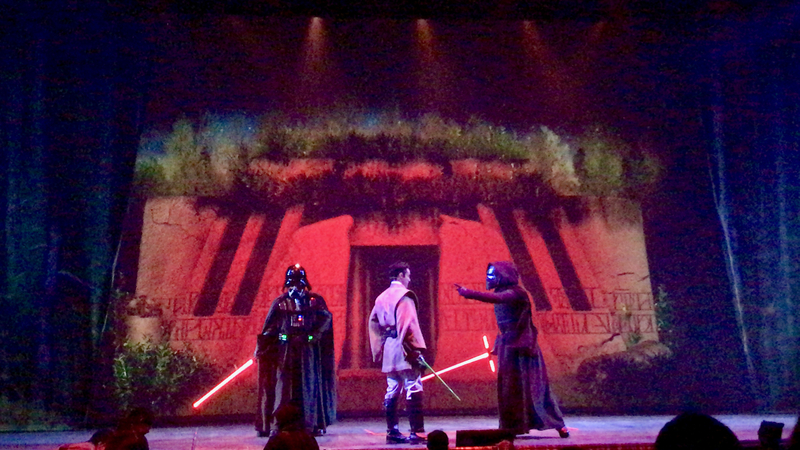 During their Jedi Training, the "Younglings" may conjure and learn to battle elements of the dark side of The Force. Photo by Alan S. Dalinka. Elsewhere during a Star Wars Day at Sea, characters like C3PO and R2D2 are available to meet and greet. Photo by Alan S. Dalinka. Other characters, even Darth Vader, may make time to meet passengers. Photo by Alan S. Dalinka. 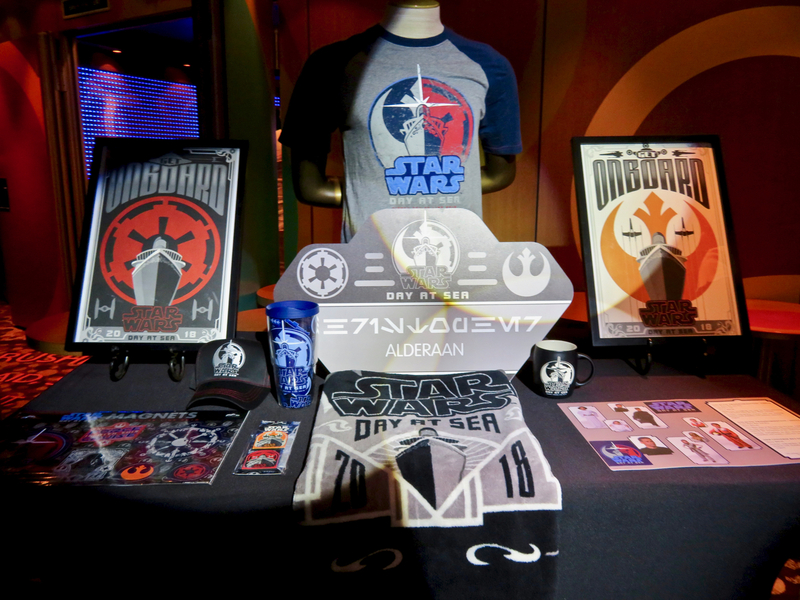 Star Wars Day at Sea merchandise is available. Photo by Alan S. Dalinka. 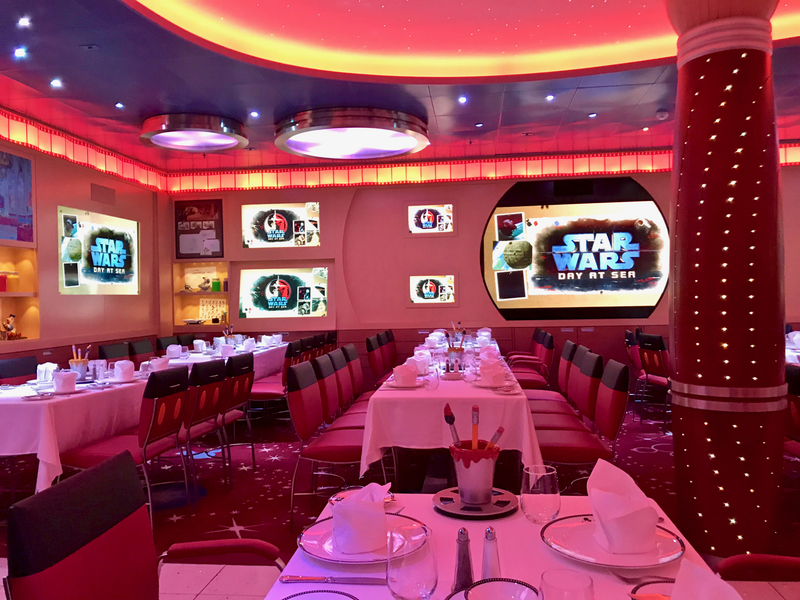 During the media preview, Animator's Palate aboard "Disney Fantasy" was decorated for Star Wars Day at Sea and served up samples of the special themed foods available to passengers. Photo by Alan S. Dalinka. 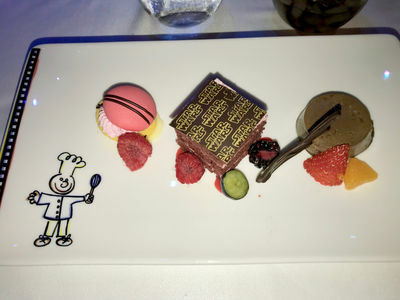 Even some of the desserts available are Star Wars-themed. Photo by Alan S. Dalinka. 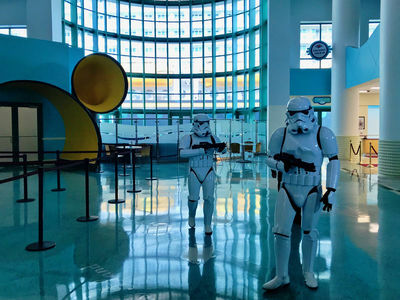 Remaining "Star Wars Day at Sea" 2018 sailings from Port Canaveral to the Eastern Caribbean depart February 24, March 10, March 24, and April 7. Remaining 2018 sailings from Port Canaveral to the Western Caribbean depart March 3, 17, and 31, and April 14. DCL recently announced dates for 2019 for the Eastern Caribbean: January 12 and 26, February 9 and 2013; and the Western Caribbean: January 5 and 19; February 2 and 16; and March 2. 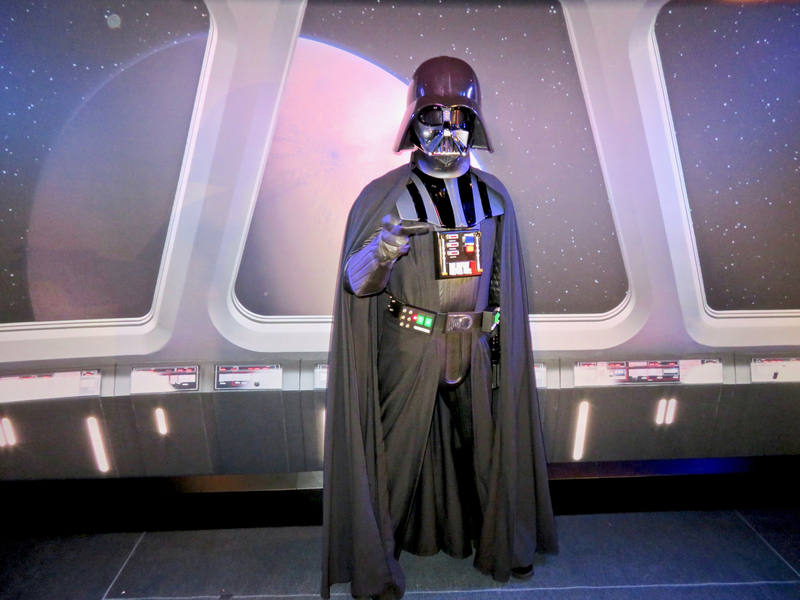 You can find more information about "Star Wars Day at Sea" and all DCL sailings at DisneyCruiseLine.com, or by calling (888)325-2500 or your travel agent. 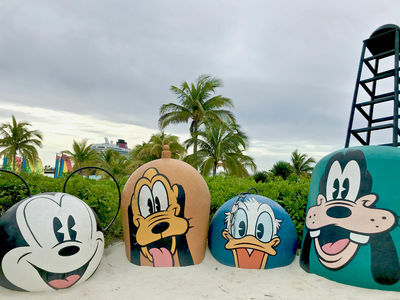 DCL also recently announced the 2019 return of "Marvel Day at Sea" aboard special five-night Disney Magic sailings to the Caribbean and Bahamas from Miami, Florida. Marvel Day at Sea is a celebration of the Marvel universe, with all-day entertainment featuring Marvel Super Heroes and foes, along with a deck show (billed as including the first Marvel "epic battle at sea"), youth activities, special merchandise, food, and beverages. Remaining "Marvel Day at Sea" 2018 sailings are Western Caribbean five-night itineraries departing March 18, April 1, 15 and 29. In 2019, the Bahamian itinerary sailings depart January 11 and 25, February 8 and 22, and March 8; one western Caribbean itinerary departs January 6 and 20; the other (which includes Cozumel, Mexico) departs February 3 and 17, and March 3. You can find more information about "Marvel Day at Sea" and all DCL sailings at DisneyCruiseLine.com, or by calling (888)325-2500 or your travel agent. Marvel Day at Sea is available on select "Disney Magic" sailings from Miami, Florida. Video ©Disney. Fun Fact (from an ex-DCL Crew Member). The ship's hull isn't black, it's "Monica Blue". Imagineers wanted a colour that was dark enough to appear black but which would reflect the blue of the water to make it seem less oppressive. They tried for a long time and couldn't find the right colour until another Imagineer/Cast Member entered a meeting wearing very dark blue, almost black, trousers. Her name was Monica! Thanks for sharing the story. I’ve heard that as well.